Presented in honor of the 30th reunion of the class of 1987, this installation features thirty works by thirty artists from the Hilary Tolman, class of 1987, Collection. This Collection includes 129 works created between the 1950s and the present, during the “creative print” (sōsaku hanga) movement in Japanese printmaking. This style of printmaking differs from the better known historical graphic tradition in Japan, called ukiyo-e. 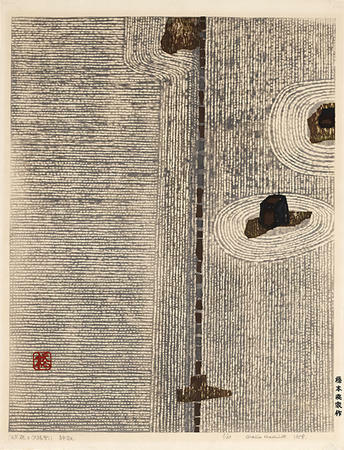 Prior to the twentieth century, Japanese prints were an ephemeral, popular art form. Mass-produced and often considered disposable, ukiyo-e prints were the product of workshops and were printed by skilled craftsmen under the direction of a publisher. Printmaking was not seen as an outlet for self-expression. While some Japanese artists began printing their own work during the early 20th century, it was not until after World War II that sōsaku hanga became widely produced and collected. A wide variety of materials and approaches to printmaking has flourished in Japan since this time, yielding a broad and diverse body of work to appreciate. The extraordinary works in the Hilary Tolman, class of 1987, Collection make SCMA one of the strongest college collections of postwar Japanese prints. Of particular interest in this collection and installation are works by important women artists, including influential pioneers such as Yoshida Chizuko, revered legends such as Shinoda Tōkō, and younger-generation artists such as Saito Noriko.